Yesterday I photographed aliens and dragons. It was a fun way to pass a few of hours on a rainy day, and I really like the way something as simple as smoke can turn into weird and wonderful figures. It triggered my imagination the same way as laying on a field on a summer day and looking up at the clouds – come to think of it, the two phenomena are closely related. 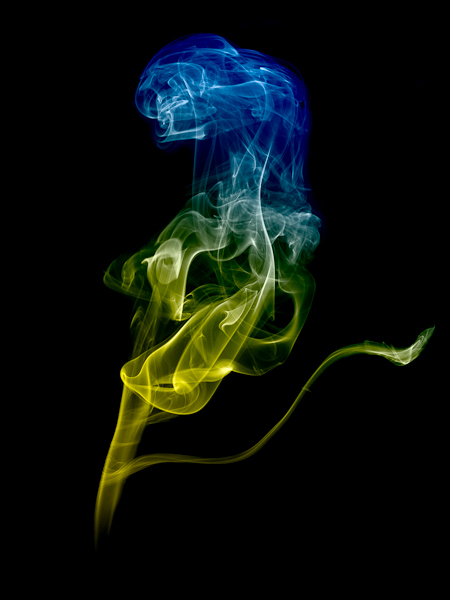 The core of the process is dead simple: Take loads of pictures of smoke. Chose the ones that contains figures or patterns which speak to you. Add colour and spice to taste. Smoke is hard to control precisely. 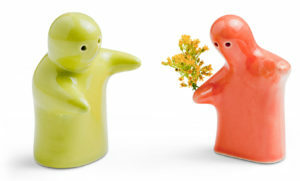 It moves in a seemingly random fashion in all three dimensions. Without clever laboratory equipment, the best way to influence it is to blow gently at it. Or create a draft in the room which will “pull” the smoke along with it. This randomness is one of the things that fascinate me, but it’s also causing one problem: How do you focus on it? And believe me, left to its own, the camera’s auto focus system will either chose to focus on the background or it will hunt for focus and eventually give up. My first idea was to use my 105mm macro lens, so I could fill the frame with smoke. It didn’t work. All the pictures were out of focus. A quick check with an online DOF calculator explained the reason: With the camera at half a metre’s distance, the area that is in focus extends 3mm in front and behind the focus point (at f/8. Stopping down to f/11 extends this to a whopping 4mm in each direction). The smoke, moving randomly, was blowing in and out of this thin focus plane. So instead I ended up with a 50mm lens one meter away from my insence stick which gave me a more managable 6 cm on either side at f/8. The downside to this is that the smoke did not fill the frames, so I ended up having to crop the pictures. This is one of the situations where a decent DSLR doesn’t help. Had I instead used a small point and shoot camera, the tiny size of the sensor would have helped by giving me almost indefinite focus regardless of how closely I had zoomed in. Oh well. I paid good money for that DSLR, so I want to use it! The next thing to consider is the lighting. Ideally you want the smoke to appear nice, crisp and white in front of a black background. That means an on-camera flash that illuminates the smoke and also illuminates the background is almost as bad as it can get. Fortunately for me, my camera allows me to take the flash off camera and place it wherever I want. So I placed it at a 90 degree angle to the axis formed by camera and incense stick, trying to avoid the light hitting the camera or the background. Had I had a large enough living room to make the distance between the incense stick and the background large enough, then there would not have been any need to use off-camera flash. 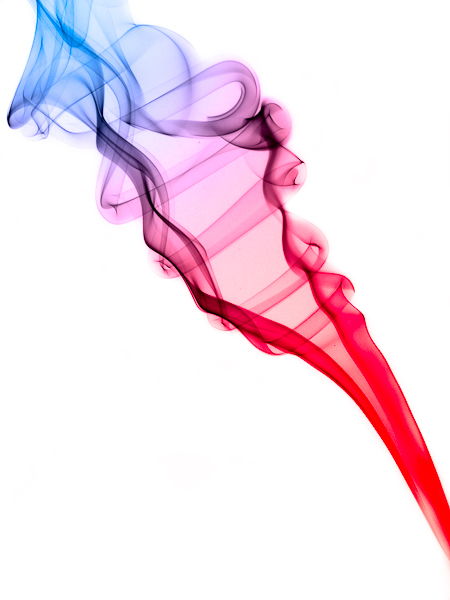 If, say, the distance from the camera to the stick is 1 m and the distance from the stick to wall behind it is 7 m, then the wall will only receive 1/256th (or a half percent) of the light that the smoke receives. This would make any wall, regardless of colour, appear nice and jet black. If I had neither had off-camera flash, nor a large room, I might have been able to get by using a very strong electric light shining at the smoke but blocked so it couldn’t reach the background. Or maybe shooting the whole thing outside at night where the nearest background might be hundreds of meters away (but trying to avoid wind which would wreck havoc with the smoke). Soon the camera, flash and a piece of black cardboard for background was set up and the incense stick was making nicely fragrant smoke. Vanilla. I don’t think it matters to the photos, but I’m just sayin’. After a bit of experimentation, I ended up with my camera set to manual at 1/200 sec, f/10, iso 100 and with the flash set to 1/2 power. The shutter time doesn’t matter at all, I just wanted it to be fast enough to be certain that the ambient light in the room didn’t contribute to the exposure at all (to get the background is as dark as possible). The aperture is a compromise between DOF (you want a tiny aperture to get a huge focus plane) and flash power (you want a wide aperture so the flash doesn’t have to work too hard). I found it too hard to peer through the viewfinder and assess when the smoke was doing something photogenic, so I just kept hitting the shutter until the incense had burned out (thank you, Nikon, for making a £3.95 remote control). That gave me a total of around 150 pictures. Good thing that digital is free! Sorting the pictures into instant rejects (out of focus, smoke is just going straight up, not enough light, too much light, etc) and potentials was quick. The second sorting, where I tried to imagine figures, shapes, movements, dragons and aliens in the smoke was the really fun part. Maybe also the most time consuming part, as I found myself staring at the smoke while my imagination was making up little stories. My small living room has reflective, bright, white walls and low ceilings. Nice for living. Also good for throwing light bursts from a flash all over the place, regardless of how much the photographer tries to avoid it. And to be honest I hadn’t put a lot of effort into controlling the light. So the background on the images had come out in a dark, murky grey rather than black. In Photoshop I picked the “burn” tool and set it to work on shadows. I traced the outline of the figures I wanted to preserve. Since the tool was only darkening shadows (i.e., where there was no smoke), it didn’t matter too much if I wasn’t 100% precise and accidently moved the tool over some of the smoke. Adding a levels adjustment layer temporarily and exaggerating the exposure makes it a lot easier to see what you’re doing. Having created the dark outline, it was easiest to then paint pure black over all the background that wasn’t meant to show at all. Adding a new layer and setting the blend mode to “color” makes it easy to colour in the figures. Pick a wide brush and just start to paint. Or add a gradient between two colours. 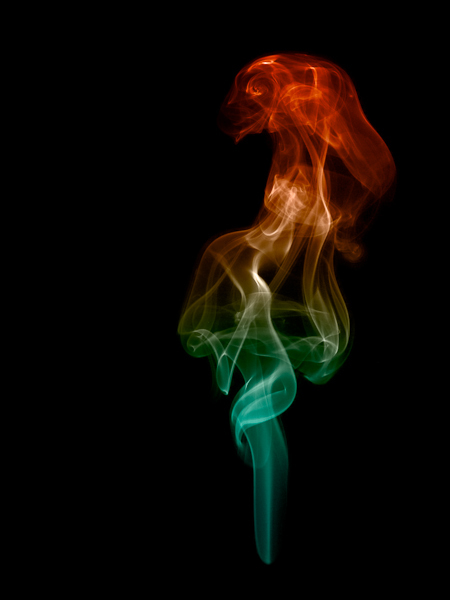 Because of the blend mode, the colour only shows where the white smoke is, so there’s no need to be very careful. So this is why it’s important to get the background pure black – if it isn’t black, it will appear in a dark shade of whatever colour you paint the figures with. 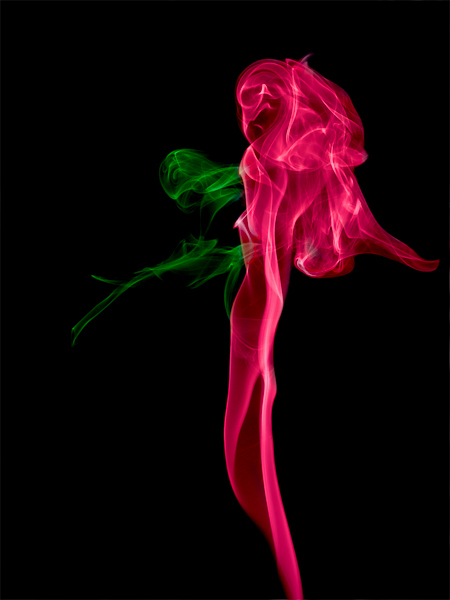 I found that where my imagination had seen a single figure in the smoke trails, I ended up just adding a gradient between two bright colours to the colour layer. Where I wanted to emphasize two different figures, such as the lady in red and the green servant, I manually coloured each figure to get control over where one figure ends and another starts. To get a bit of diversity, I inverted some of the pictures (image, adjustment, inverse) so they appear as coloured shapes on a white background rather than black. After inverting, cleaning up of the background can be done by the dodge tool set to work on the highlights (because now the smoke is dark and the murky background is off-white). So there it is. There are dragons and aliens walking amongst us. We can even photograph them. It’s just a matter of finding some of that childhood imagination again. This blog post was first posted 7th June 2009 on another forum. I was lurking at the elegant themes site, trying to find out how to set up a membership website, and saw that you were one of the members online, so i followed the trail to your site. AND I LOVED your smoke photo trick. and it goes to show that abstract can be real too. I was a full time artist in 2008 – and i know that your work would sell well. ahhh. internet marketing first – then who knows..
thank for a nice site. Thank you very much for your kind words. 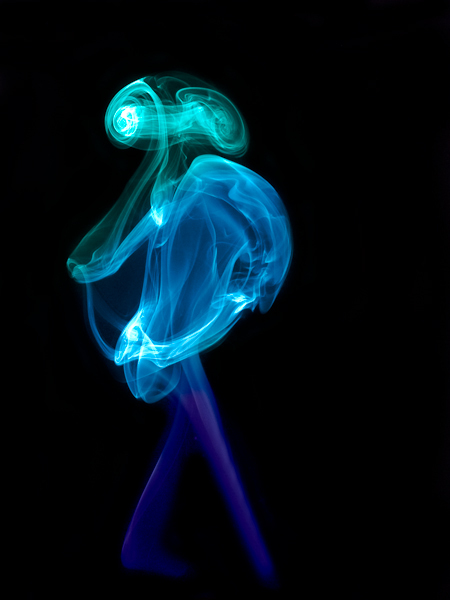 The smoke figures just goes to show that sometimes we can do a lot with just a little bit of imagination. That’s one of the reaons I find them so fascinating.